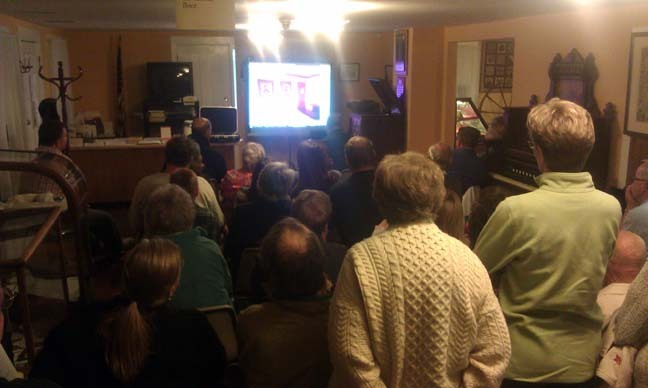 September 2011 Meeting - Tony Olszewski reports on the McHenry County Paranormal Research Group's findings. March 2010 Meeting - Daniel J. Johnson as Thomas Morris Chester. 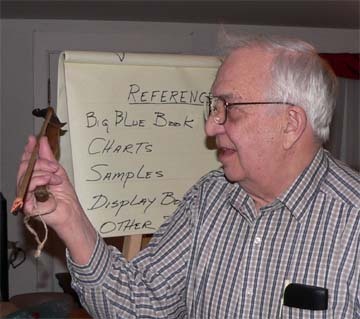 November 2007 Meeting - Diana Dretske - "Lake County, Illinois: An Illustrated History"
March 2007 Meeting - Earl Beese - "Native American Projectile Points"
January 2007 Meeting - "Treasures from the Attic" - our annual show-and-tell. Earlier this year the McHenry County Paranormal Research Group investigated the Mother Rudd Home. They believe they have identified some paranormal activities in and around the house. Tony Olszewski, MCPRG's lead investigator, shared their process, and their findings, at our general meeting: photographs, reports from empaths, and other readings. Here is an article from the Daily Herald about this presentation. 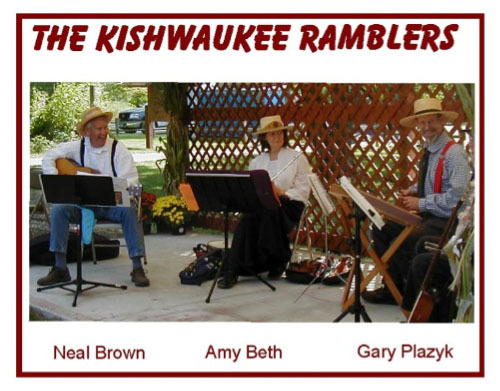 August 13: we hosted a live performance from the Kishwaukee Ramblers. They performed songs from the pre-Civil War era all the way up to mid-1900s. We thank Neal, Amy and Gary for sharing their music with us. 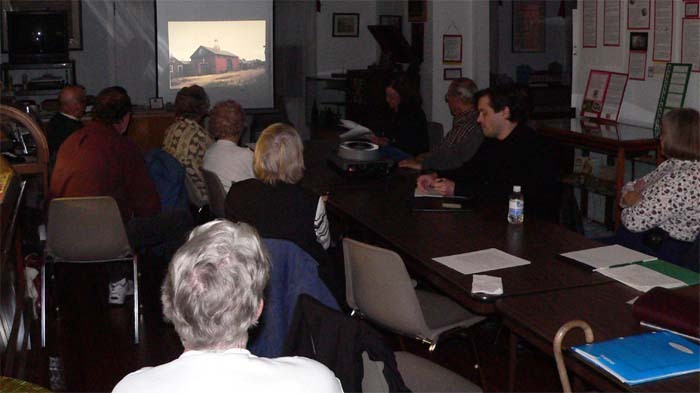 Video of the Kishwaukee Ramblers playing at the Mother Rudd Home Museum, August 13, 2011. Ty Rohrer, Museum Supervisor for the Waukegan Park District, had a delightful presentation about Waukegan native son Jack Benny. 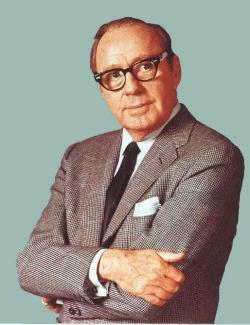 We saw slides of his life & times, and a video episode of the Jack Benny Program. Here is a Jack Benny Program video clip - listen for the mention of Waukegan High School (and some ad libs) near the end. On August 14th & 15th we had our Gurnee Days open houses. We feel we had a nice turnout with a total of about 100 adults, plus children. Our workers were, Ann Kekatos, Ron & Trish Wendt, Joe Lodesky, Michael Weiland, Al Westerman, Robert Haugh and Tom & Clarissa Mellen. We also had a few ladies demonstrating handquilting. 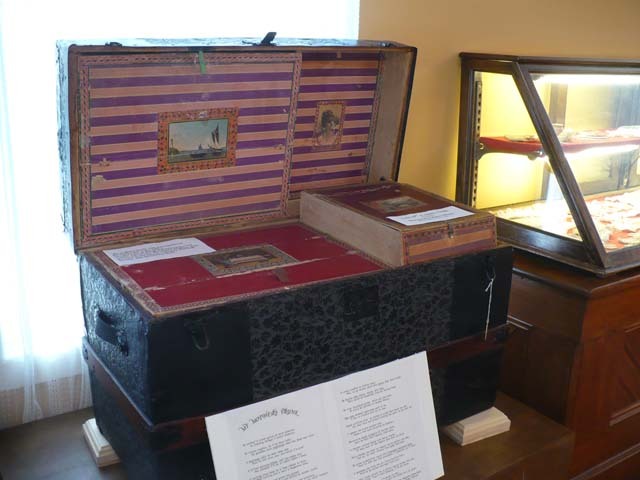 The new displays for the Gurnee days open house, were from Bernelda Clem's "My Mother’s Trunk". They were donated by Carol Clem. We are planning to keep them on display for quite awhile. 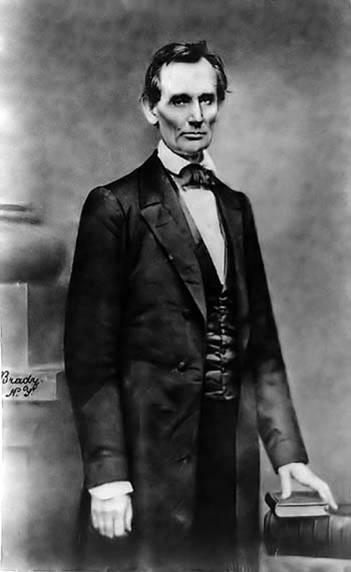 Krista Holst of Grayslake presented this family-friendly program focusing on Lincoln’s personal history and legacy. Holst, a long-time Lincoln admirer, grew up near Springfield and New Salem, and worked at New Salem State Park as part of the Youth Conservation Corps while in high school. 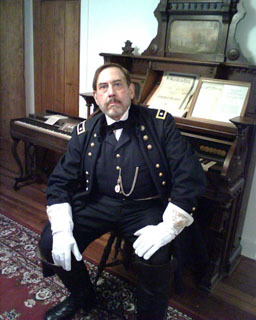 Re-enactor Daniel J. Johnson portrayed Thomas Morris Chester. In 1864-65, Chester was Special Correspondent to the Philadelphia Press, travelling with the "U.S. Colored Troops, Army of the James." He was the only African American covering the Civil War for a major daily newspaper. Read more about Daniel J. Johnson in the Kenosha News. More about Thomas Morris Chester from the Newseum, the "museum of news" in Washington, D.C.
Every January, rather than a formal speaker, we traditionally host "Treasures from the Attic". 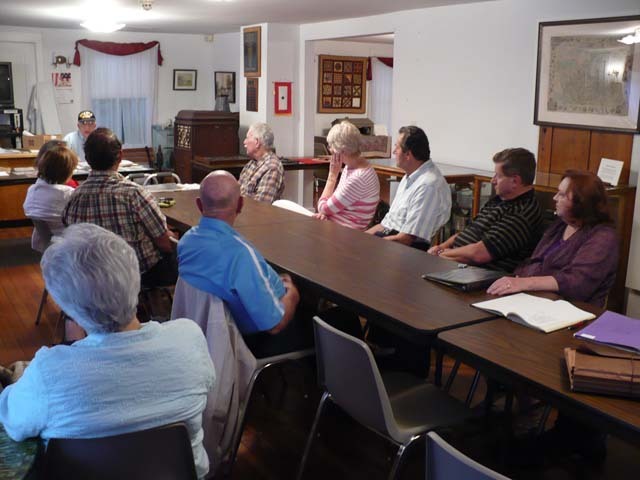 Members are encouraged to bring historical artifacts and explain a little about their significance. We will also show items from the WTHS collection. 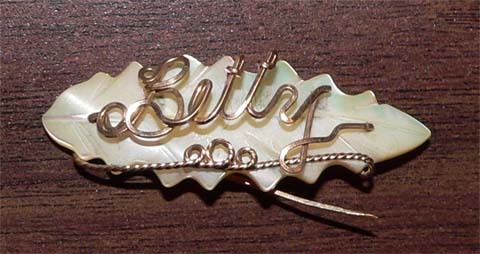 Right: a small handmade pin, a Christmas gift for Betty Hickey in the 1940s. She also shared a copy of her husband's hand-written soldier's diary from World War II, describing various missions in Europe. He later became a prisoner of war, held in Germany. 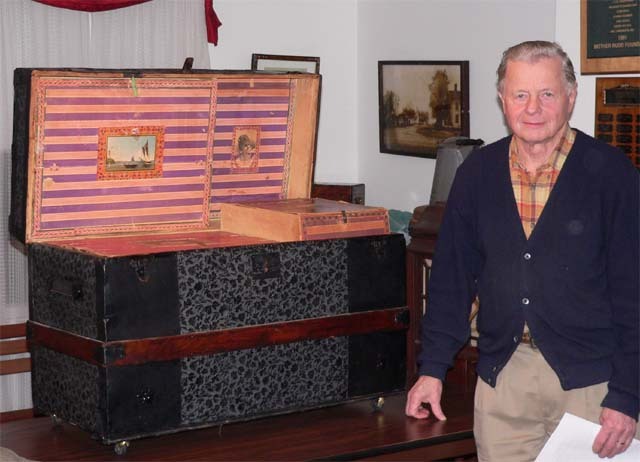 Left: Tom Mellen shows off a recently accessioned steamer trunk, last owned by Bernelda "Bill" Clem. It originally belonged to her mother, Margaretta Bayes Moyer. Right: part of a quilt brought in by Jenet Bakke. 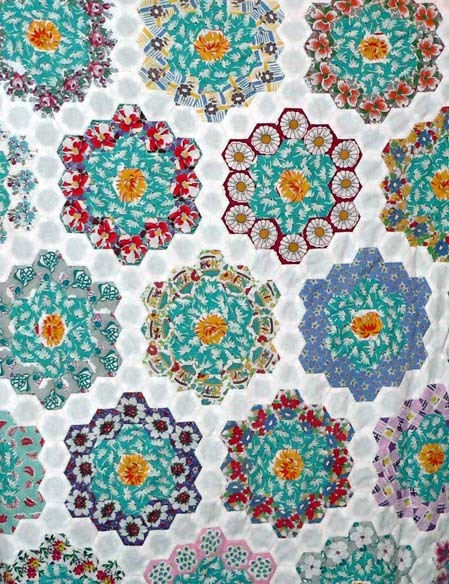 This is in a "Mother's Flower Garden" pattern. The material is from feed sacks, flour sacks and sugar sacks. 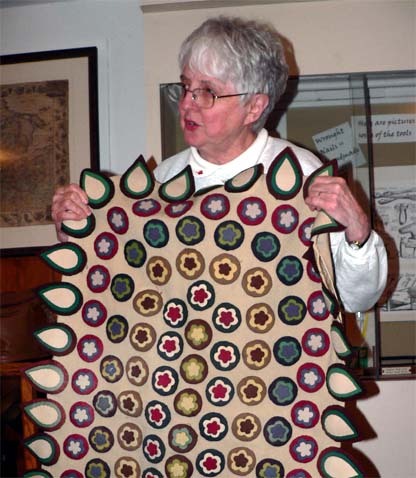 Left: Ruth Brunke shows a "penny-pieced" felt rug, made by her mother. 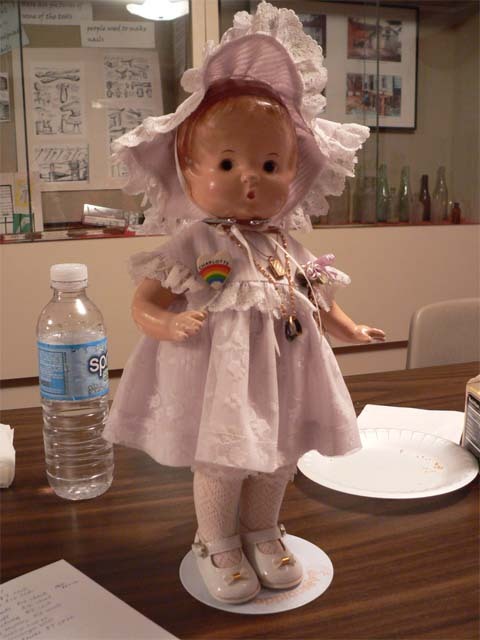 Right: This "Patsy" doll, dating from about 1928, was brought in by Sandra Michaels. Sandra also had a 19th Century Swedish-language prayer book, and an antique 5th Grade Reader. 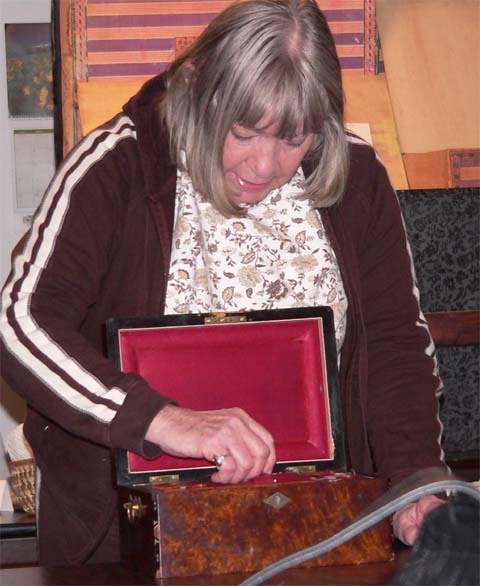 Left: Clarissa Mellen shows a sewing box that was her grandmother's. Her grandparents were married in 1889. She also showed framed pictures of her grandparents. Joe Lodesky brought in samples of barbed wire from his Warren Township farm, including a 19th Century fragment, and a modern sample for comparison. Tom Groth brought in a small metal ball, apparently found by squirrels on his property and placed in an acorn stash; it may be a musket ball. Marge Miller brought a glass "salt dish", which pre-dates the use of salt shakers. Thanks to everyone who brought in treasures to share! 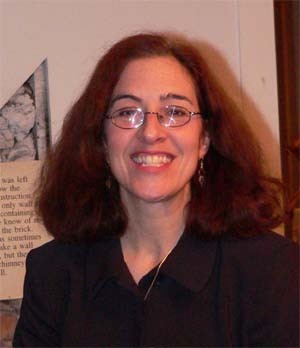 Christine Pyle, Historical Resources Manager at the Lake County Discovery Museum, presented "Women in World War II". Christine showed us the history of the Curt Teich postcard company, and showed us how its archives reflect the lives and times in years past. Postcards in the archive illustrate women in military service, on the home front, and in organizations like the U.S.O. About a third of all U.S. Navy recruits in World War II trained at Great Lakes Naval Training Center in Lake County, including many women. 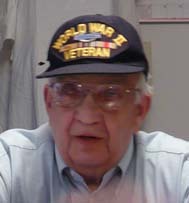 Earl Beese of the Lakes Regional Historical Society presented on World War II: a personal account of combat conditions, through the eyes of a young infantry soldier with the 75th Infantry Division in Europe. Earl was one of the youngest American soldiers in the European theatre. He shared stories and artifacts of his experience, and some more-recent photos from a family visit to where he fought in Belgium and Germany. 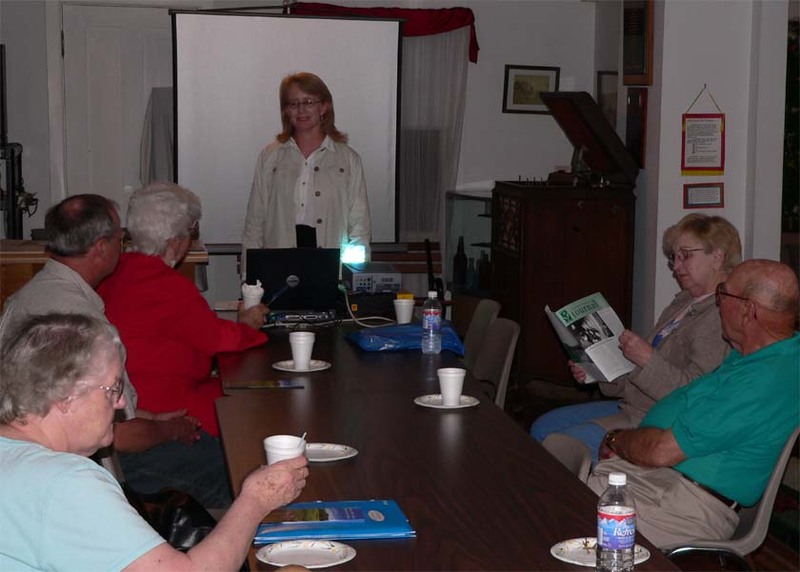 Diana Dretske, Historical Society member, and collections coordinator at the Lake County Discovery Museum, talked about "Abolitionism and the Underground Railroad in Lake County". A few vestiges of the UGRR still exist in Lake County: a cabin in Deerfield, "Kuhn's Rock" (a landmark in what is now Old Mill Creek), and of course the Mother Rudd Home. 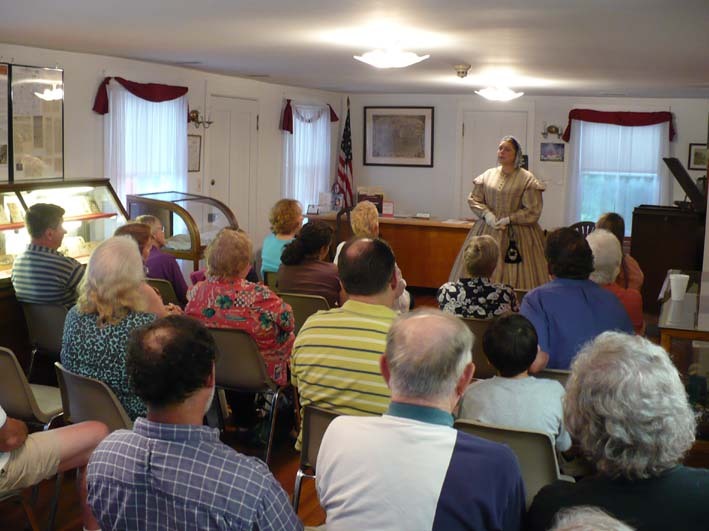 Diana Vickery, Historical Society member, and former volunteer at Warren-Newport Public Library, discussed “Learning History Through Historical Fiction,” and give tips on books to choose. 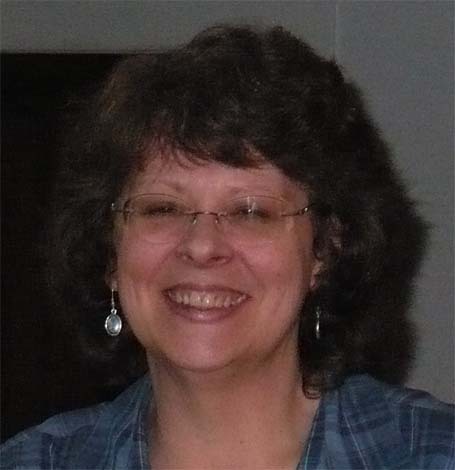 Diana has retired as an editor from ManPower and now edits the Lake County Genealogical Society's newsletter. Diana also devotes time to her search for “Cozy” books. at the Mother Rudd Home. Max and Donna Daniels gave us a stirring portrayal of Abraham and Mary Todd Lincoln. 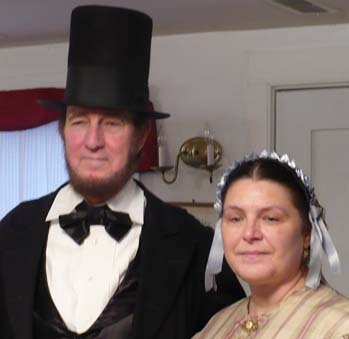 Max & Donna have been portraying President & Mrs. Abraham Lincoln professionally since 1988. They were featured on C-SPAN during the Lincoln-Douglas Debate series in 1994, and on the "Someone You Should Know" program on ABC/channel 7 in Chicago. 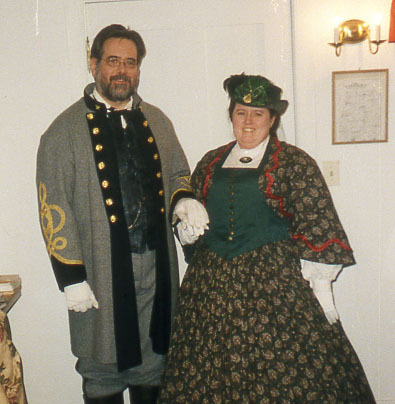 Since 1995, they have performed on numerous occasions at the Lincoln Home Visitor Center in Springfield, IL, and in 2001 they were invited to perform at the Discovery Theatre for Children at the Smithsonian Institution. They have performed for national encampments of the Sons of Union Veterans , and for the Midwest Civil War Round Table conference. Max has also appeared in several commercials, including a video for the Admissions Department of Lincoln College , Lincoln, IL. Click here for a video of Max & Donna Daniels as the Lincolns. Jerry Kowalski at the Rudd House organ. Jerry Kowalski gave a first person account of General George Thomas, commander of the Union Army of the Cumberland. A Virginian who graduated from West Point, he served in the Mexican War and western battles before joining Union forces in the Civil War. He was known as the Rock of Chickamauga for his valor in that battle. His troops attacked Missionary Ridge and successfully fought the battles of Franklin and Nashville, TN. 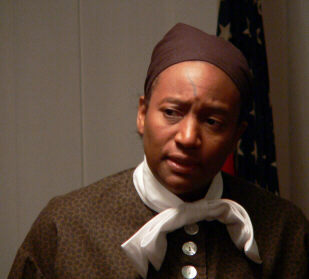 Pamela Welcome portrayed Underground Railroad conductor Sojourner Truth. You may remember Mrs. Welcome from our memorable March, 2005 meeting. She holds a Bachelors of Arts Degree in Acting and Directing from Northern Illinois University in DeKalb, Illinois. She currently performs Black Women in History. These performances feature Harriet Tubman and Sojourner Truth, for schools, libraries, church groups and other various organizations. Ms.Welcome will soon be seen as Leotha Henkshaw, a black "Rosie the Riveter" who broke the color line in industry in Chicago during World War Two. Mrs. 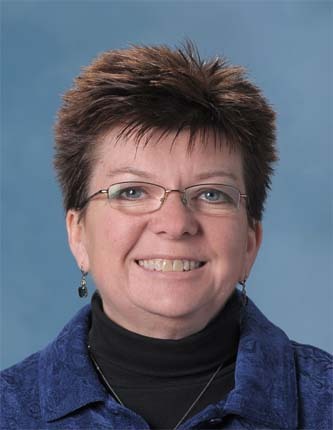 Welcome is a resident of northern Illinois, where she resides with her husband and two children. Click here for a video of Pamela Welcome performing. 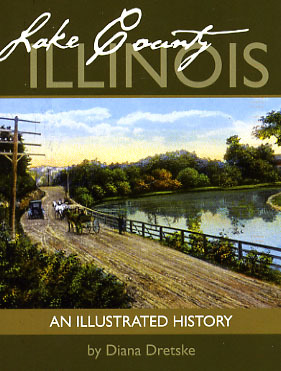 Member and historian Diana Dretske present some highlights from the new Second Edition of her book, "Lake County, Illinois: An Illustrated History". We saw glimpes of scenes from the earliest history of the county, from the Ice Age to Marquette & Jolliet's exploration of what is now Illinois Beach State Park - in search of a passage from the Great Lakes to Asia. Diana showed pictures of native American "trail trees" - a few of which are known to survive still today in Lake County. We heard stories of colorful characters like Col. Elmer Ellsworth, who led a crack French-style military drill team, the Zouave Cadets. Col. Ellsworth became the first Union officer to die in the Civil War. Thank you Diana for sharing your stories and pictures! SARAH SURROZ, Stewardship and Education Coordinator of the Liberty Prairie Conservancy, informed members and guests about innovative efforts to preserve open space in Lake County. We learned about the social and economic benefits of open space preservation. Lake County today enjoys the highest ecological diversity of all the 102 counties in Illinois. 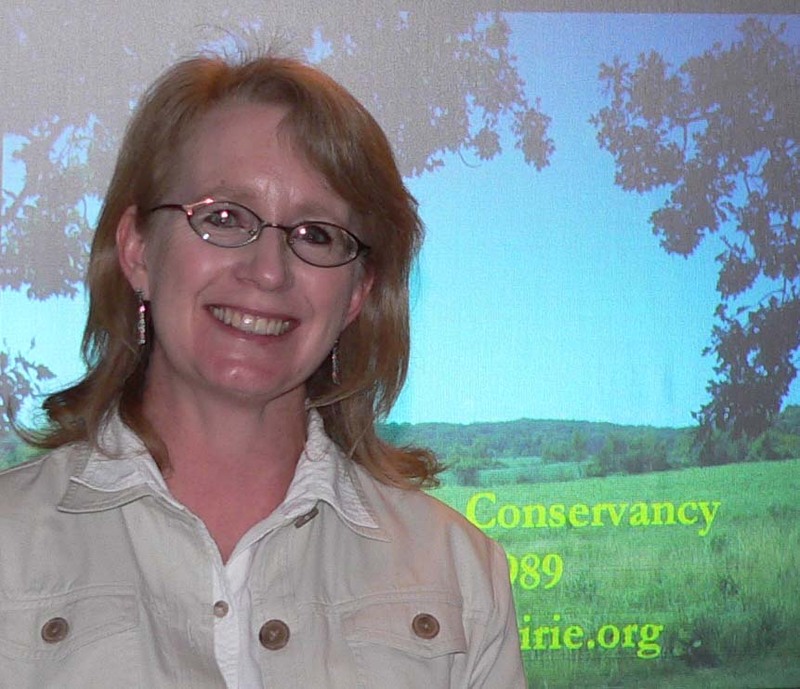 Sarah introduced members and guests to the concept of "conservation easements", which enable landowners to guarantee open space in perpetuity and secure tax benefits, while retaining ownership. 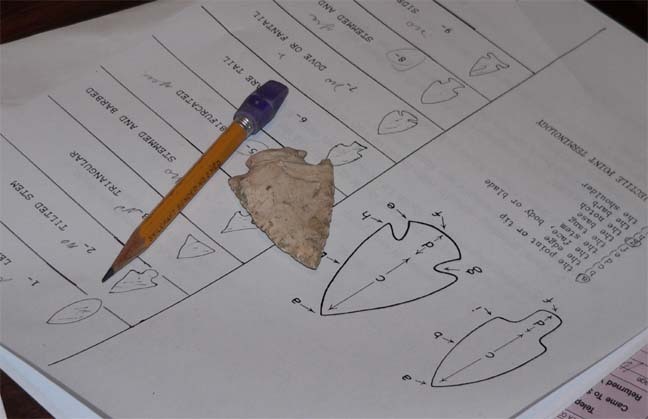 Earl Beese of the Lakes Region Historical Society (Antioch) gave an informative presentation on Native American "Projectile Points" -- often referred to as "arrowheads." Earl points out that the bow and arrow was a relatively recent innovation (c. A.D. 400) with respect to 12,000 years of human habitation in northeast Illinois; earlier points would have been used on spears, knives or other tools. Earl provided samples of points to each member and guest in attendance, and a set of guidelines for classification. We each then had the opportunity to identify and classify each sample. A sampling of our newly acquired bound archives of the Lakeland Press Gurnee Press and its predecessor Warren-Newport newspaper, complete, dating back to 1963. Thanks to Jim Balmes, Skip Neiburger and Marge Miller for bringing in artifacts to share. The "Tuesday morning work group" starts off 2007, working on accessioning and cleaning. 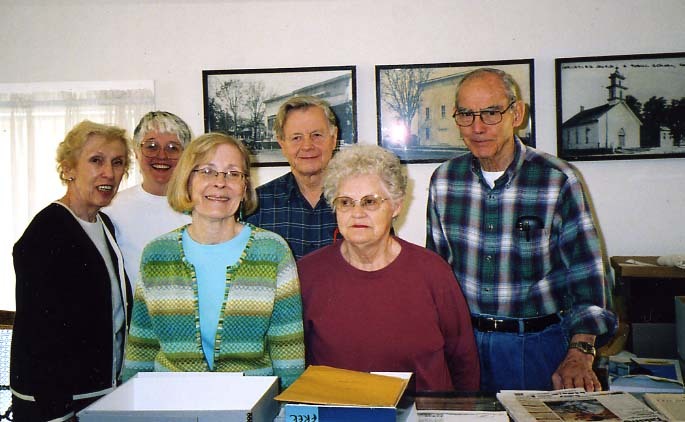 Left to right: Joyce Buehler, Ruth Brunke, Jill Martin, Tom Mellen, Marge Miller and Don Haugh. 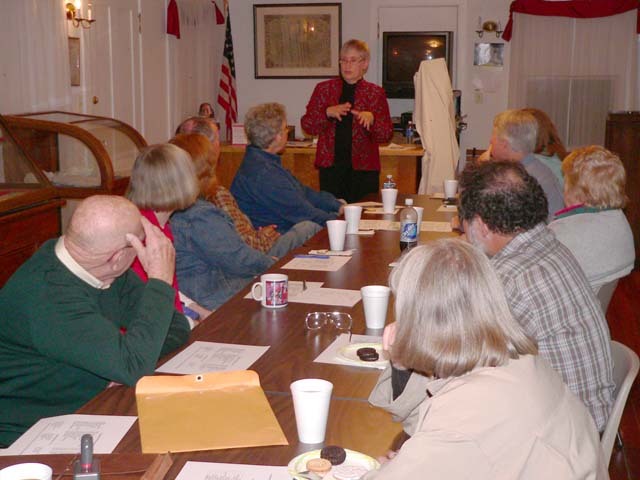 The Historic Alliance of Lake and McHenry Counties, representatives of the museums and historic houses in both counties, met April 25, 2006, at the Mother Rudd House. Standing is Mike Mills of Highland Park. Quilters meet at the Mother Rudd House nearly every Friday afternoon. 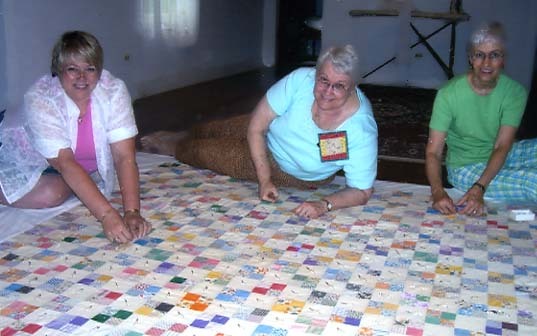 Pinning a quilt top in preparation for quilting it are (left to right) Debbie Cimaglia, Marge Redding and Linda Warren. Janice showed us buildings and farmsteads maintained by wealthy landowners in and near Lake Forest. Many were built by leading architects including David Adler. We learned of the pioneering advances these farms made in hygiene and breeding, which became state-of-the art practices in modern agriculture. Remnants of some of these farms still exist, and some are being restored. publication of our new book, Gurnee and Warren Township, edited by our Vice-President Jill Martin, with contributions from members of the Society. Joining us were members Al Westerman and Diana Dretske, who described the production and publication of their recent titles. Al Westerman, author and publisher of Public Domain Land Sales in Lake County, which he previewed at our November, 2005 meeting. "Living historians" SHANNON FERGUSON-MUNNS and JIM MUNNS were our featured speakers at the March meeting. We learned about clothing, foods, and other aspects of everyday life in the Civil War era. AL WESTERMAN talked about the earliest settlers of Lake County, including the history of how land was surveyed, divided up, and made available for purchase from the federal government. Al has researched Lake County's first settlers back to the original land patents and grants. His forthcoming book will include maps of each township in Lake County, showing all the original settlers' lands. See the story in the Pioneer Press Gurnee Review. SUE CRIBB (with special guest, husband Jay Cribb) introduced us to Lake Villa history - "When Lake Villa was spelled L-E-H-M-A-N-N." Sue shared with us information about the Lehmann family, founders of The Fair department store, and their various summer "cottages" in and arouund Lake Villa. Thanks Sue and Jay for the history and stories. 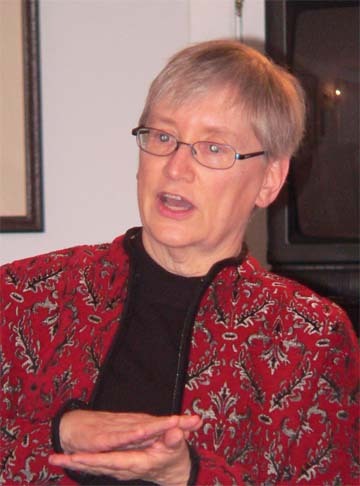 Our thanks to PAMELA WELCOME, featured speaker at our March 1st, 2005 general meeting. Pamela gave a captivating performance in speech and song, in the persona of Harriet Tubman, illustrating Tubman's life and her work on the Underground Railroad. We were delighted to have approximately 50 members and guests in attendance to enjoy the evening.